Accelerated pairings - what do we want? The FIDE Swiss Pairings Commission is having another stab at defining a good method of accelerated swiss pairings, although it has already run into some predictable problems. The first is one of defining what a 'good' system is while the second is find a method. For most people a 'good' system is one that minimises 'junk' rounds, although how this is measured can be tricky. Reducing the average difference of ratings in the early rounds seems to be a good measure, although this may cause unintended side effects. Another measure might be getting approximately the same standings in a N-2 round event as you would in an N round event. And coming at it from a slightly different direction, increasing the number of norms in the event might also be a goal. As for the method a number of different systems are being trialled. The somewhat discredited bonus point system is being looked at, although the issue of 'bad' pairings when the acceleration stops is already apparent. Graduated bonus points systems (eg 1 bonus for the top half for 2 rounds, dropping to 0.5 for the next 2) are also being trialled, although the results aren't conclusive. Slightly more complicated systems are also being investigated, but for know it is still a work in progress. The Telegraph newspaper has done a large piece on Magnus Carlsen. It is both a profile and interview, and has already attracted some comment, mainly due to his comments on past World Champions (he could beat Tal 'easily'), and the quality of his current rivals. Of course he isn't the first chess player to attract attention for such claims, with a young Bobby Fischer making similar claims in his infamous 1962 interview with Ralph Ginzburg. Of course Carlsen is more measured (and polite) in his comments, but is still an interesting exercise to read both interviews side by side. While both interviews show the level of confidence needed to reach the top in international chess, I am sure that Carlsen's interview won't have the same end result as Fischer's interview, which was Fischer refusing to do interviews ever again. While writing yesterdays blog post about losing on the white side of the Frankenstein-Dracula, I remembered an interesting game I had previously played on the black side of the same opening. It was from the 2006 Chess Olympiad, and was played as part of the PNG v Bermuda match. We lost the match 2.5-1.5, but if I had taken my chances (instead of a repetition), then 2-2 would have been the result on the day. Competitive games between myself and my son tend to follow the same script these days. I look for the sharpest opening possible, try and hack him off the board, he defends until I make a mistake, and then he moves in for the kill. On rare occasions he either slips up in defence, or I manage to find the right attacking moves, but this is increasingly rare. The latest example came from a rapidplay game played earlier this week. The Frankenstein-Dracula variation of the Vienna, gives White material at the expense of development. To be honest I think Black has better chances, although in this case once I castled I was more than OK. However I overplayed my hand with a discovered check, and when there was no good followup, Ra1+ just destroyed me. Earlier this year there was talk the the next World Championship Candidates tournament might be held in the United States. It was an attractive proposition, with two US players in the field (Caruana and Nakamura), and FIDE President Kirsan Ilyumzhinov even going so far as announcing it would be in the US (at the closing ceremony of the 2014 World Championship). However, when it came to finalising the details, the US option disappeared, and the tournament will now be held in Moscow. At the time of the announcement it might have been safe to assume that the US option was just posturing and was never a serious contender, but it may now be for another, far more serious reason. The US Treasury has announced sanction on a number of individuals, for "providing support to the Government of Syria, including facilitating Syrian Government oil purchases from ISIL". One of the individuals on the list is FIDE President, Kirsan Ilyumzhinov. While these dealings are (I assume) in his private capacity as a businessman, the press release does highlight his role as President of FIDE, and also the murder of Larisa Yudina in 1998. Given the serious nature of these charges, it is of course unthinkable that Ilyumzhinov would have been allowed to travel to the US, and that the source of any funding for the event would have come under very close scrutiny. I assume at some point FIDE will release a statement on this matter, although for now there is nothing on its official website. Russia has won both the Open and Womens Sections of the European Teams Championship. For a long time this sort of news would be in the same category as "sun rises in east" and "water is wet". However in recent times the Open team has struggled to match its individual talents, with wins in World Teams (2005, 2009, 2013) being the main exception. The last time Russia won this event was 2007, and the drought is even longer for the Chess Olympiad (2002). There have been a few theories put about why this is so, but the two I lean towards are (a) the pressure of expectation and (b) they still haven't quite mastered the team oriented approach (+1=3 match results). On the other hand the Womens Team has bee far more successful. They have won all the events since 2007, with the exception of 2013, and have won the last 3 Olympiads as well. In this case the I suspect the gap in talent between Russia and other teams is a little greater than in the Open section, so individual ability counts for more. As for the other teams, Armenia finished second on tie-break, ahead of Hungary and France. England seemed happy with their top 10 finish (despite being 5th seed), while Norway had the services of Magnus Carlsen on top board, although the mid table finish, and his own score of 50% showed that it is not only teams that have trouble in this format. The article "Grandmaster crash: The inside story of how English chess pawned its future" has caused a bit of a stir in English chess circles. Coming soon after a somewhat bizarre AGM (mentioned in the article), it highlights the effect that problems with the English Chess Federation have on English chess itself. Written by Stephen Moss from the Guardian (who is an active player as well), it has already attracted a bit of blowback in the English Chess Forum, as well as some choice comments below the story itself. I might be tempted to draw parallels with the Australian chess scene, but in all honesty I would struggle to. The governance systems are different (although Nigel Short's comments on small organisations ring true), but the major reason is that Australia never fell from any great heights in the first place. The ACF has always been a "limited government" style organisation, so the list of things it has failed to do well is actually quite small. I suspect this will probably blow over in a week or two, and it will be business as usual. Those involved will point out that their small bit of English chess is running well, extrapolate that to "what needs to be improved" and potentially miss the broader picture. I always have mixed feelings when I come up against opening system I have a fondness for. While it doesn't happen that often (due to my somewhat narrow opening repertoire) I have been on both sides of the Blackmar, the Marshall Gambit, and the Frankenstein-Dracula over the years. Back in 2003 I must have been on a bit of a 1.d4 d5 bender, as I had a couple of games against the BDM with the Black pieces (not sure where I had stashed my Griuenfeld). 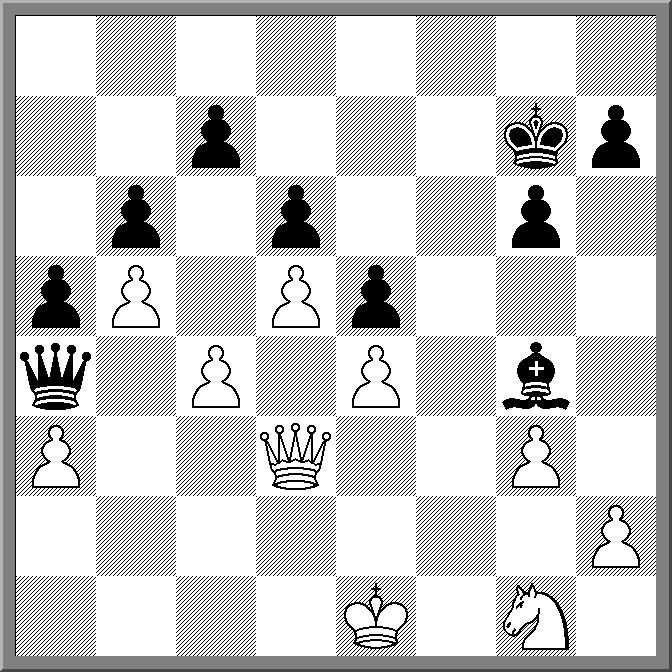 One of the games was against many times ACT Champion Milan Grcic, and was essentially decided by one move. On move 13 Gricic chose to attack my Knight and threaten my f pawn with Qf3, but I realised that I could let f7 fall with check as he did not have a decent follow up. I on the other hand had lots of good moves after capturing on d4, and his position fell apart after I played Qxe5 and then Nf3+. A sad defeat for the BDM (which is my main weapon against 1.e4 d5) but an enjoyable win for me. Having lamented my inability to spot the necessary and spectacular yesterday, today I came across a game by a player who did no miss much when attacking. Alexander Alekhine is rightly regarded as one of the greatest attacking players in history, and has a number of brilliant wins to his name. 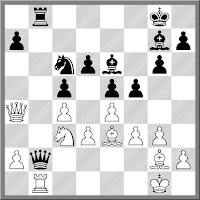 The following game is quite famous, and Alekhine considered it one of his best games. The key move is 26. ... Re3 which at the time he thought won in all variations. It turns it it doesn't quite (27. Bf3! 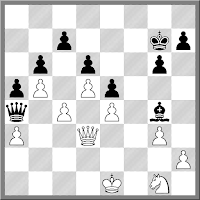 gives Black no more than a very complicated draw), what after Reti played 27.Nf3 Alekhine does not miss a trick. Play through the game below, up until move 19 (which is where I've stopped the game). Up until this point most of White's moves have been either natural or thematic, although the sacrifice on b5 (and the counter sac on f2) are not the most accurate. Now White would love to sac the queen on h7 but obviously at this stage it does not work. On top of that the rook on d1 is under attack, leaving White with a bit of a choice. But it is exactly the fact that the rook is threatened that should provide White with a clue about what to do. Can you find the crusher for White here? Over the last few days I have been gluing both of these ideas together, to provide a game replay system with online analysis. One of Nigel Shorts most celebrated game his his famous win against Jan Timman, where he marched his king up the board to assist in a mating attack. However, for every successful king walk, there are probably 100 times as many king 'drags' where the unwilling monarch is forced to walk the plank. An example of such a situation occurred yesterday in the European Teams Championship, and Short was on the wrong end of the score line. Playing Hrant Melkumyan from Armenia, Short had his king forced up the board, starting on g2 on move 39 and reaching f8 by move 48. After that it was not long for this world, getting checkmated on e6, and move 50. Chess is one thing you don't retire from due to age (well, not normally). You might choose to give the game away for other reasons, but just being old is not a barrier to continuing to play. Evidence of this is in the World Seniors Championship currently underway in Italy. The tournament is running in 4 sections and interestingly the 65+ section has attracted more entrants (185) than the Over 50 section (100). The Over 50 events is a little stronger in terms of GM's (10 v 7) but both events show that there is a capacity for seniors chess. The Women's section are substantially smaller (27 for both events) but the odd statistic from these events is that there are more titled players than untitled players in both tournaments. There is the odd Australian and New Zealand player in these events, and you can check out the results here if your wish (the link is the the 50+ Open, but the other tournaments can be found there as well). As someone who reaches 50 years old next year, I suddenly become eligible to play from Jan 1 and depending on work/finances etc I may add the PNG flag to those hanging over the tournament hall. The 2015 Vikings Weekender has finished in a tie for first place between IM Moulthun Ly and IM Anton Smirnov. Starting the second day on 3.5/4 (along with Michael Kethro), Ly drew with IM Junta Ikeda, while Smirnov could only halve the point with Kethro. Ly then defeated Kethro in Round 6, while Smirnov beat young Canberra player Albert Winkelman. Final round wins over Litchfield (by Smirnov) and Jason Hu (by Ly) left them tied on 6/7 and earning $725 each. IM Junta Ikeda finished outright third on 5.5, while Albert Winkelman finished his excellent tournament with a win to be the best Under 1800 player on 4.5. The Under 1600 event saw a 4 way tie for first place when draws on the tops boards in the final round saw Thomas Johnston, Jamie-Lee Guo, Tim Pearce and Bazli Karattiyattil all end up on 5.5/7. One other meritorious result in this event was that of local club legend Karl Galli who finished on 4/7, winning the Under 1200 prize. While numbers were slightly down from last year (52 v 60) the tournament once again proved enjoyable for those that took part. Certainly the tough schedule of 7 games across two days (at 60m+10s) left a number of players looking frazzled by the end, although surprisingly this included some of the younger players as well. The event was sponsored by the Tuggernanong Vikings Sports Club (Open plus junior prizes) and O2C (Under 1600). The tournament was jointly organised by the ACT Chess Association and the Tuggeranong Chess Club. The tournament will once again be held next year, although it might be slightly later in November, to avoid a clash with end of year school and university exams. The 2015 Vikings Weekender started with a field of 52 players, down 8 players from last year. Worryingly the drop occurred mainly in the Open section, where despite a prize pool of nearly $2000, only 16 players entered. One theory is that players rated between 1600 and 1800 are staying away because it is too tough, but if this is true, then it isn't a good outcome for Canberra, or even Australian chess. The small field in the Open means the event is much more cut throat. With very few easy games each point has to be fought over, and a number of players are already looking nervously at the field to come. After 4 rounds IM Anton Smirnov, IM Moulthun Ly and Michael Kethro share the lead on 3.5/4. Smirnov and Ly drew a 99 move game in round 4, while Kethro scored 3 straight wins after starting the event with a half point bye. IM Junta Ikeda is half a point behind the leaders, his only loss coming at the hands of Smirnov. In the Under 1600 event, 4 players share the lead on 3.5. Jamie-Lee Guo, Thomas Johnston, Oscar Hellmann and Tim Pearce are all undefeated so far, and look forward to a tough morning round. Full results and live coverage can be found at tournaments.streetchess.net/vikings2015 You can even replay the live games from earlier in the tournament to see how the leaders made there way to the top. Tomorrows action begins at 10:30am (Canberra time) with Smirnov and Kethro featuring on the top board. The 2015 Vikings Weekender begins tomorrow and hopefully a last minute rush of entries will lift the field above 60 players. If for some reason you aren't able to make it you can follow it online via tournaments.streetchess.net. The page contains links to the standings plus live coverage of the top 2 or 3 boards. I have also added a link to the dgt replay system which I am developing, and so you can see games from previous rounds (I have also put up last years round 7 games from the event). This system is still in beta so it is both a service and a test run! Currently the field is headed by IM's Ikeda, Ly and Smirnov although the $1000 1st prize may lure a few more titled players to the national capital. A few years there was a marked improvement in the strength of Go playing programs, with the development of the 'Monte-Carlo' search. In a Monte-Carlo search, a move tree is generated to a certain depth (using all legal moves and replies) but when evaluating the leaf nodes a fixed number of games are played to the finish (using random legal moves) and the percentage number of wins is used to score the start position. On first inspection this looked like it should not work, but for a number of games (including Hex and Lines of Action) it produced good results. However the results when applied to chess have been less promising. I suspect that the reason for this is that in chess all it takes is one mistake to lose, and such a search routine does not overly weight losses. For example, a given position might have 24 moves that lose for player A and 1 that wins, and a random selection would only find 4% of the games winning for player A. On the other hand a human player should find the win 100% of the time, making their opponents previous move bad. For the other games, such dramatic swings are less common (due to the rules of the game) and so an advantageous position more closely matches the eventual outcome. Another 'remember the position' exercise from a game at the ANU Chess Club. White had been under a lot pressure earlier on, but after the exchange of rooks and some minor pieces, had avided the worst of it. In fact the Black queen, which had come to a4 to threaten the queenside pawns now found itself in a cage, after White blocked the retreat with b5. Of interest to the kibitzers was how White could attack the imprisoned queen, especially as he only had 10 seconds left (although with a 10 second increment as well). In the end he found the following moves, which while not winning the queen outright, was good enough to win the game (again based on my imperfect memory). This year is my 8th year of growing my usually voluminous mo, and as the picture to the right shows, I am already off to a good start. However, unlike previous years I will be going for quality over quantity, although for now I am aiming for a huge block of marble, before I chip away to reveal the masterpiece within. It is of course for a good cause, and I am taking donations. 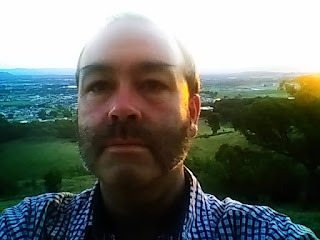 You can visit http://mobro.co/shaunpress either to make a donation, or just to see my somewhat sporadic updates. 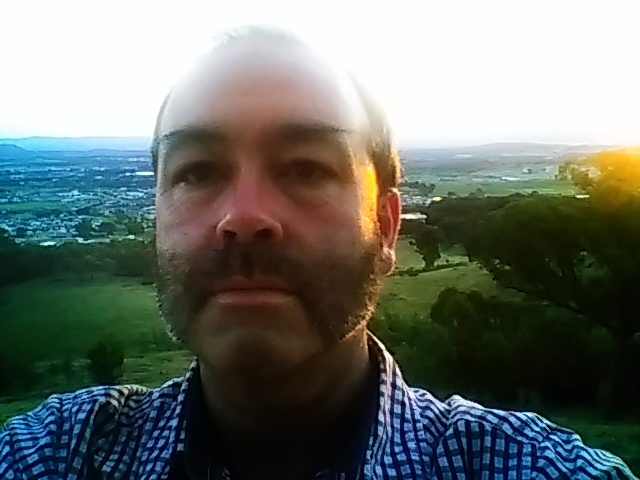 And thos who wish to check my mo out in person, don't forget to drop into the Vikings Weekender! One stage that a lot of chessplayers go through when starting out is the 'copy cat' stage. Trying to play risk free chess, they think that copying their opponents move can't hurt. The only problem with this is that chess isn't a symmetrical game, and there are of course some moves that can't be copied (You normally can't meet a check with a check, unless it is chess on TV). Some openings do lend themselves to symmetry more than others, with the Four Knights Opening and the Symmetrical English springing to mind. Even then one player usually breaks the symmetry around move 10 or so. The longest "symmetrical" game is the following between Rotlewi and Eljaschoff (according to Tim Krabbe). Even then it is not truly symmetrical (symmetry is broken as early as move 2), although from move 3 the moves match (although if the only condition is that the final position is symmetrical then I have seen plenty of endgame's that end this way.) The other issue with this game is that is was apparently just a very long agreed draw between the two players in the final round of an event. In fact White missed a much stronger continuation on move 13 (demonstrating the danger in copying) with the line 13.Bxe5 Bxe4 14.Bxg7 Bxg2 15.Bxf8 Bxf1 16.Qg7# stopping Black from replying. A number of years ago I heard a story about Viktor Korchnoi having to ask an arbiter if he could castle when his rook was attacked. It was one of the 'ha ha Grandmasters don't know the rules' stories that you hear every now and then, without knowing whether it is actually true or not. It turns out there is some doubt about the story, and I have seen a few different versions told. There is less doubt a similar story concerning Yuri Averbakh, who when playing CJS Purdy, thought that Purdy had castled illegally queenside as his rook passed over an attacked square (b8 in this case). Amazingly, I saw examples of both of these situations in the one game that was played at Street Chess today. On move 13, Alana Chibnall castled kingside while her rook on h1 was attacked by the bishop on c6, and then 9 moves later Miles Patterson castled queenside, with the rook passing over the b8 square that was attacked by the bishop on f4. When I pointed this out after the games both players simply shrugged, as while unusual, they both knew that castling was perfectly legal in both cases. Only a week before the 2015 Vikings Weekender begins. It is already shaping up as a strong event (in the Open), and a competitive one (in the Under 1600). The $1000 1st prize in the Open (sponsored by the Vikings Club) is certainly attractive, and apart from IM Junta Ikeda (current top seed), it is expected a few other titled players will be taking part. Thanks to generous sponsorship from O2C the Under 1600 is also offering $500 for first, which is a tidy some for a weekends chess. The tournament runs over the weekend of the 14 and 15th November at the Vikings Rugby Union Club, Ricardo St, Wanniassa. It will be a 7 round swiss with a time limit of G60m+10s (for both sections). Entry fee is $65 ($45 for juniors & concessions). You can register for the event (no payment reqd) at http://vesus.org/festivals/2015-vikings-weekender/ If you do not know your ACF ID (or even rating), just put something in, as all the ratings and ID's will be checked prior to the start of the event. Digging through my old score books I cam across the following game. I can remember being quite pleased with this game, although at the time I knew I was lucky to get away with the win. The exchange sacrifice was of course unsound, but paid off when my opponent moved his king to the wrong square, allowing me to execute a smothered mate a la Philidor. The other thing that stood out was the look of surprise on my opponents face when the Queen went to g8. I'm not sure whether this was because he had never seen this checkmate before (unlikely), or simply that he missed the finish in this case. One of the features of the play of Jose Capablanca was his use of the 'petit combination'. This was a short tactical sequence that was designed to create a positional advantage. It usually involved a brief investment of material, which was then won back a few moves later, with an improved position being the ultimate reward. Here is a more recent example of such a combination (based on a game I saw last night, but I suspect not an exact replica). White has just swung the rook to b1, offering the knight on c3. After 1. ... Qxc3 2. Rxb8+ Nxb8 3.Qe8+ Bf8 4.Qxe6+ Kg7 5.Bf1 White has a much better position, and won soon after (I think the Black king was checkmated on h4 at the end). Interestingly, more recent examinations of Capablanca's games has shown that in some instances his opponents missed better defences, which would have thrown some doubt on the soundness of the combination. And so it was in the position (although maybe not the actual game). Instead of recapturing on b8, Black could have surrendered the exchange with 2. ... Bf8 gaining an extra tempo to capture the pawn on d3 (Qe1+ is also a threat), with plenty of play. Inspired by the Anand - So game from the Bilbao Masters (where 6 queens were used at various stages), I went looking for games where 6 queens were on the board at the same time. In the past such games were as rare as rocking horse poop, and the ones that did exist were considered either faked or arranged. Despite the vast number of games played, and recorded in databases over the last 20 years, the number of games has not really increased. I only found 3 games, from 1992, 2000, and 2009. The game from 1992 seemed real up until a point, but the triple promotion to end the game looked entirely contrived. 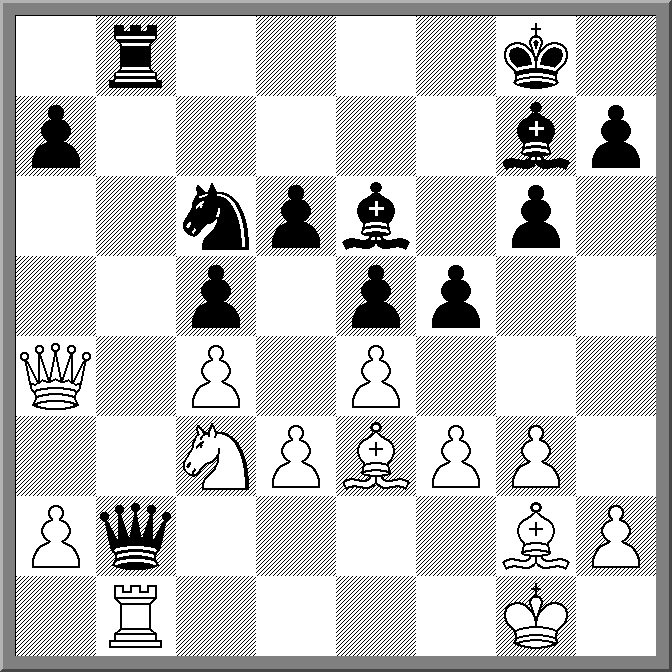 The game from 2000 certainly looked pre-arranged, as the game was drawn after 16 moves. This left the following game from 2009. While it was also a draw the length of the game, and indeed the moves at least makes it look like the only genuine 6 queen game on record. When FIDE implemented faster times for the Chess Olympiad a number of years ago, there was quite an outcry against it. Chess was a serious game requiring serious thinking time, and a push to faster time limits was just a gimmick. These days the outcry seems to have died down, and it seems that almost every big event is introducing their own time controls. Only having increments after move 40 (or even 60) seems to be a thing at the moment, as time scrambles are back in fashion. The latest tournament to try a faster time control is the Zurich Challenge, which is moving to the even faster time limit of 40m+10s per game. So spectators won't feel cheated, they are planning to play two rounds a day under this format, so there will be around 4 hours of chess. In my opinion this is veering very close to a rapidplay event, and in fact is rated as such. A number of years ago I experimented with 40m+30s per move (for a weekend event) but a number of players felt that this was too fast for "real" chess and the experiment was not repeated. But it is the sponsors right to organise events however they wish, and if a player does not like the time controls they can always pass on the event. However looking at the invite list (Anand, Nakamura, Kramnik, Aronian, Giri and Shirov) it seems that the fast time control is something they can live with, although it is also a time control they all look comfortable at. The final event of the 2015 ACT Interschool Series was held today, with Lyneham High qualifying to represent the ACT at the 2015 Australian Schools Teams Championship. They are joined by Radford College (Secondary Girls), Kaleen Primary (Primary Open), and Caroline Chisholm (Primary Girls) as representatives from the ACT. Full results can be found at the ACT Junior Chess League web page.